I stood at the top of the stairs and looked down the long workshop. I saw workbenches, men’s faces, and white aprons. It was 1955, I was 15 years of age and just left school. I was nervous and shy. I got the job because my mother was an office cleaner for the Great Western Railway. (GWR) The Docks and Inland Waterways, and The Pierhead Building at Cardiff (which is now a museum). This entitled her to two free tickets a year on the railway and any member of her family was able to work at a trade for the GWR. 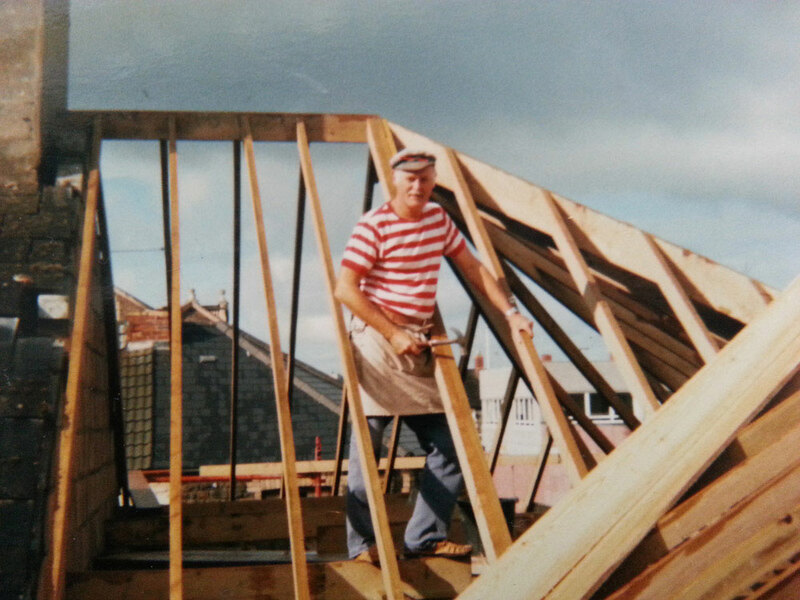 There were a number of trades I was offered, including carpentry and joinery. The workshop was above the mill on the first floor. It contained every day items for general use, namely long seating benches, small stool benches, saw horses, trestles, bench hooks, clamp blocks, mitre box, and of course not one, but two shove halfpenny boards (one of oak and the other of greenheart-french chalked). The shop consisted of nine workbenches, double sided, each approximately 12 feet long with metal vices and some wooden vices at each end. The well of the bench contained loose boards that could be lifted out to hide personal work from the foreman’s notice. There was also a drawer on each side for the tools used that day. The tops of some of the benches were chipped and gnarled from years of use. Underneath was a shelf containing offcuts of different jobs and woods of every kind. Each man’s bench was his own personal domain or world of work (his bench was sacrosanct). It was never worked on by any other person except by permission. Some old timers would not even allow anyone to sit on the bench, as this was considered bad manners. The men were either carpenters and joiners, qualified to wear the white apron as a badge of their trade, or just carpenters. The carpenters were unqualified and so they did the rough work on the docks such as lock gates, pontoons, coal tips (which lifted the coal wagons and tipped the coal into the waiting ships). These men wore the blue overalls of the GWR workforce. Hanging above their benches on the wall were various tools used daily: an adze, crosscut saw, and large auger bits with a hole at the end for a wooden handle, which ranged in size from 2 to 4 inches. I remember being allowed to use the adze on a piece of greenheart for a lock gate. The edge had to be rounded over; the men joked that it would be safer to stand with your feet in 2 buckets to avoid cutting the toes off. At each bench was a large, black wooden toolbox with white initials painted on the front, which no one would go into without permission (an unspeakable crime if done so). Billy cans and enamel mugs were stored in a small cupboard hanging on the wall by each bench containing tea, sugar, and a tin of condensed milk. A small mess room for eating meals was at the end of the shop, but was rarely used as the men preferred to eat at their benches and stretch out on top for a snooze at the dinner hour. Woe betide the apprentice who made a noise during that sacred hour. Each man’s tool chest contained his saws (the rip, panel, dovetail, and coping saw), chisels, hammers, mallet, screw drivers, moulding planes, squares, and gauges, wheel brace and drills, Stanley ratchet brace, and bits protected in a bit roll and the wings kept sharp. The bits ranged from a quarter to one and a quarter. A rare piece was the sight of an expanding bit with a single spur and moveable wing for larger holes. No electrical drills were seen or used, no electrical tools of any description were seen on the benches. Holes in the wall were made by hitting a rawlplug chisel with a hammer (and the occasional knuckle). Saws were sharpened by the craftsman himself on the saw horse, especially after the terrible misfortune of hitting a nail secreted in the timber or a slotted screw joint when reducing a table top. When that happened then a groan would go up from all who heard it and felt it as happening to their own saw. Then a saw set was brought into action, the spring type with a dial for T, P, I. A file went along the length to even the teeth height. Then one side sharpened, then the other, avoiding what was called ducks and drakes, meaning large and small or uneven teeth. No matter what kind of saw, the same loving care was taken on the joiners personal saw. Then they were oiled and stored in the tool chest on buttons attached to the under side of the lid. Of course the most desired or prized saw was the Henry Disston of Philadelphia, USA. The combination of Philadelphia steel and the expertise of Henry Disston who served his time with Spear and Jackson of Sheffield, England, made it the most sought after and prized saw to be obtained. The tool chest contained moulding planes of various shapes and sizes. The bead, ovolo, round, and hollow (no routers then) were all carefully stored in a safe position for the cutting iron. 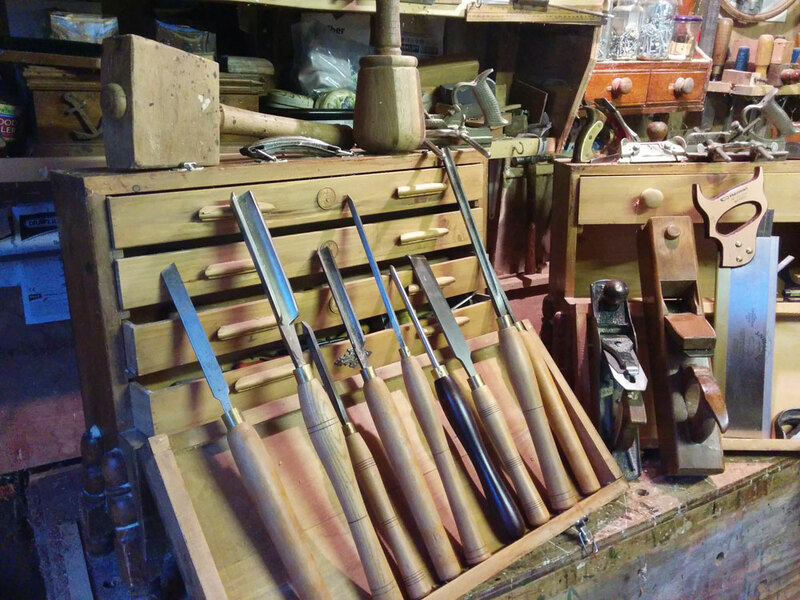 Also in the tool chest were the Sash Fillister (or plough) with its brass tipped ends, spokeshaves (wooden and iron), wooden jackplanes, wooden smoothers, all stamped with the craftsman’s name. Although most men desired and had the metal jack and smoother planes made by Stanley. The oil stones, both rough and smooth, were encased in a mortised out box and lid, lovingly protected and cleaned. Slip stones for gouges and moulding plane irons were all stored with oily rags covering them from damage in the safe drawers of the tool chest. Paring chisels, firmer, mortise and bevelled, cleaned and edges protected in the drawers. They were always used with a mallet, never hit with a hammer. That was considered to be the wanton action of a botcher and a sin to the joiners code of conduct. A craftsman was assessed by the condition of his chisels. A splintered top on a chisel handle was a sure sign of mistreatment and the sign of a botcher.